The Emerald Pool and the Blue Lagoon are part of the Khao Phra Bang Khram Nature Reserve, and their waters come from thermal hot springs that are deep underground . As such , the whole area becomes a hotbed from all over south eastern Thailand , and this leads to a lot of cramped conditions , where your enjoyment of the pools will be curtailed by the sheer number of people sharing the space with you . This Emerald Pool in Krabi province is one of our top suggestions for things you should do in Krabi, Thailand and the number one recommendation for enjoying the underground natural springs that flourish in Krabi province. Emerald Pool or pond is not a hot spring, but it is cool water that is just heavenly to swim in. The water is replenished by natural streams running into the pool from freshwater sources on the limestone hill above . 200 baht fee into the Emerald pool , The price for children and Thai nationals is less . From the entrance you have two choices, the long walk or the short walk to the pools. The long walk is 1,400m along a raised concrete path that has been built through the rain forest, it’s a very pretty walk past ponds and streams. The short route is 800m along a dirty track. I recommend taking the long route in and the short route out . Please be careful when you are walking on the edges of the pool. It is very slippery because of high calcium carbonate deposits . Please be careful when you are walking on the edges of the pool. It is very slippery because of high calcium carbonate deposits . Emerald Pool or “Sra Morakot” in Thai language is a national park under “Khao Phra Bang Khram Nature Reserve”. Hidden in lush green rainforest , this natural pool is approximately 23 meters wide and 1-2 meters deep . Emerald Pool is also known as “Crystal Pool” . Emerald Pool is a nice place for swimming and relaxing, especially in the morning when the crowd is lesser . Besides Emerald Pool , there are other smaller pools around the area worth exploring . Another 400 meters walk from Emerald Pool will bring you to Blue Pool . 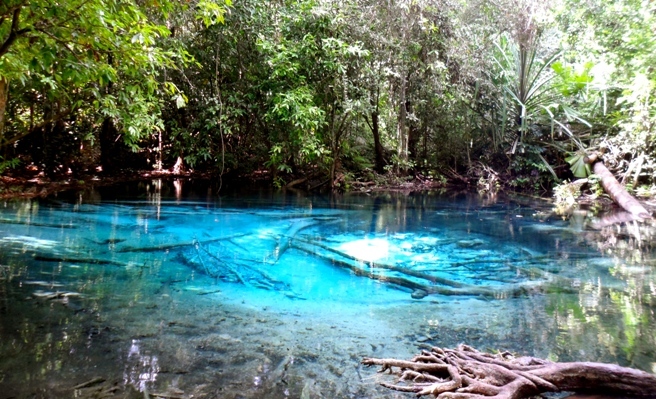 This is a beautiful pool with deep aquamarine-blue water , but is not suitable for swimming . 1,400 meters hike from Emerald Pool is a 200 meters-deep pool named “Sra Gaew Pool” . The Blue Pool will be closed to visitors during May until October . After that it will be open during Nov untill April . The closure coincides with the breeding season of the rare Gurney's Pitta bird . Emerald Pool is open daily from 7.30 am to 5.30 pm. Entrance fee is THB200 per person for tourists (THB20 for locals), and THB20 for parking .